There are lots of methods to reduce conservatism in estimation of the DoA . Set invariance conditions for singular linear systems subject to actuator saturation have been given in . Output feedback stabilization of linear systems with actuator saturation has been considered in . Stable actuator saturation compensators have been designed in frequency domain . 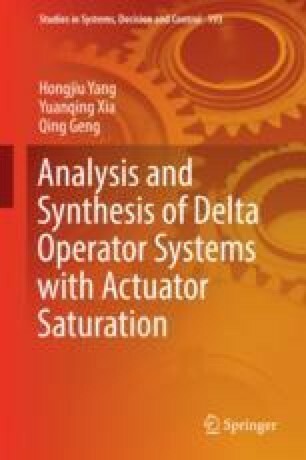 Some methods of estimating the DoA and properties of null controllable regions have been presented for continuous-time and discrete-time systems with actuator saturation . The majority of the methods are mainly based on a concept of a Lyapunov level set. A saturation-dependent Lyapunov function captures real-time information on severity of actuator saturation and leads to less conservative estimation of the DoA for discrete-time systems . It is a good idea to further reduce conservatism in the estimation of DoA using a general Lyapunov function for DOSs . Using the saturation-dependent Lyapunov function , real-time information on severity of saturation thus leads to a less conservative estimation of the DoA , which is based on solution of an LMI optimization problem. Hence, the saturation-dependent Lyapunov function in DOS subject to actuator saturation will get a better result than the one only using quadratic Lyapunov functions , which motivated us for study in this chapter.